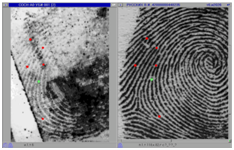 Global trusted BioLink's AFIS fingerprint algorithms of filtering, encoding and matching ensure highest reliability and accuracy for law enforcement fingerprinting. The BioLink's coding technology provides perfect recognizing of ridge patterns as well as detecting and describing of minutiae (coordinates, orientation, ridge counts and ridgewise relations). Input of tenprints into the system is achieved via LiveScan devices. During this process, the system defines the print boundaries, integral features (loops, deltas, whorls, types of patterns), minutiae points (beginnings or endings of papillary lines, bifurcation of lines, islands, spurs, etc. ), as well as poor quality areas. The images of prints are encoded (checked for special features used in matching) automatically. 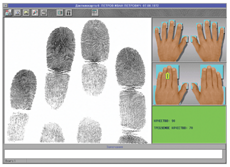 The full electronic tenprint card contains alphanumeric descriptive information, rolled and plain fingerprints, palmprints, classification formula, mugshots, SMT photos, and verbal portrait. Input of latent prints can be performed from photos or transparent dactyloscopic films through flatbed scanners, as well as from any other data storage via video input device. Latent print encoding is done in an interactive mode, i.e. an operator can control any stage of the encoding process and, if necessary, correct either the integral features allocation or the pattern skeleton. Detection of a complete set of features is done automatically based on the pattern skeleton. The process of input of tenprints and latent prints is completed with the entry of text information. This information consists of the basic data (ID, crime description, police department, etc.) and complementary data (details about a person, etc.). Access to dictionaries makes text data entry a straightforward process. BioLink AFIS performs the following types of searches: tenprint/latent, tenprint/tenprint, latent/tenprint, and latent/latent. Automatic creation of a search query with standard query parameters can be set up for every new tenprint and latent print entry. A search query with either standard or arbitrary parameters can also be made for any tenprint and/or latent print from the existing database. A search can also be performed through the whole database or a particular part of it according to some specific conditions, such as the region, type of crime, age, etc. Formed queries are set in a queue for search. An operator can control the queries, change their priority and, if necessary, delete the queries before the search begins. As a result, the recommended list of probable candidates is generated. Any communication channel providing IP connection (telephone lines, wireless channels, optic-fiber or cellular network, etc.) can be used for data transmission. BioLink AFIS provides the ability of remote entry of fingerprint and palm print data, as well as remote access to a Central Database. The BioLink AFIS/APIS allows for bringing the textual part of the database out onto the Oracle server providing thereby the openness of the AFIS/APIS to other information systems. All changes in the alphanumeric data stored in the AFIS/APIS database are synchronously replicated in the Oracle server.